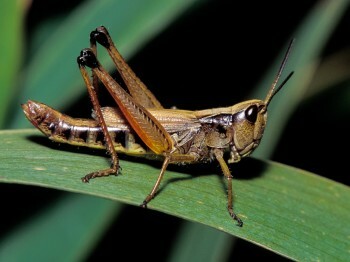 Visit almost any weedy field, lawn, or dusty dirt road in the summertime, and you will encounter grasshoppers (locusts), familiar orthopterans that can be distinguished from katydids by their short antennae or horns (some people refer to katydids as “long-horned grasshoppers” and the locusts as “short-horned grasshoppers”). Grasshoppers are ubiquitous in sunny habitats across North America, although they are usually absent or uncommon in northern areas and in wet swamps and marshes. Few species inhabit shaded forest, and those that do are generally found in small clearings that receive direct sunlight. Most grasshoppers are well camouflaged with coats of brown or green, but there are some rather colorful species (such as the well-known Eastern Lubber Grasshopper of the southeastern states). There are over 650 species of grasshoppers in North America, a huge number to be sure, and most of these are western in distribution. 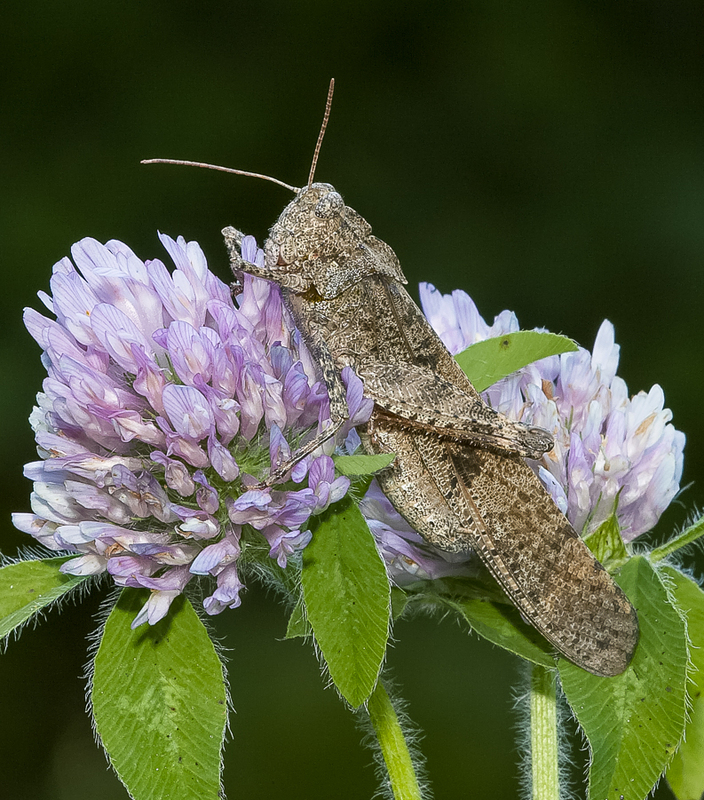 Unlike the noisy meadow katydids, the majority of grasshoppers do not stridulate. 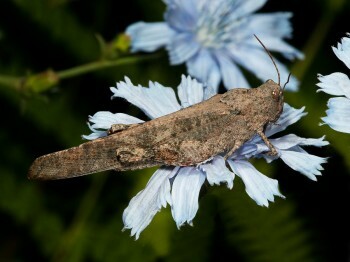 But there is one group, the slant-faced grasshoppers, that are known for their soft and muffled songs. Males of this group “fiddle their tunes” by rubbing pegs on the inner surface of their hind femurs against the edges of their forewings. Another group, the band-winged grasshoppers, make an entirely different kind of sound. Males, and sometimes females, make loud snapping or crackling sounds with their wings as they fly, especially during courtship flights. This unique mode of sound production is called “crepitation,” the snapping sounds apparently being produced when the membranes between veins are suddenly popped taut (band-wings also stridulate, but their songs are typically weak and subtle). 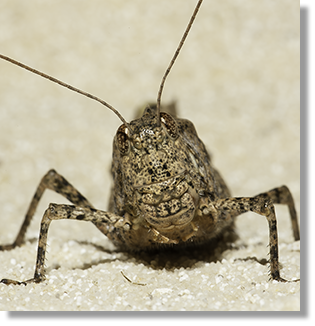 Because most grasshoppers do not make sounds, and those that do are difficult to hear, we have decided to feature only three species in this guide, including a common slant-faced grasshopper that stridulates (Marsh Meadow Grasshopper) and two band-winged grasshoppers that crepitate (Carolina and Boll’s Grasshoppers). Most commonly heard crepit-ating on sunny afternoons. Soft, rapid raspy notes from fields during the day.